InDepthNH.org takes no position on politics but welcomes diverse opinions. The opinions expressed here belong to the writer. The next House session will be at the call of the chair. For planning purposes, please save the date of Monday, April 29th at 10:00 a.m. in Representative’s Hall for an overview for legislators of the recently completed New Hampshire 10-Year Mental Health Plan. Before I start talking about the Democrats’ reckless budget, I want to take a moment to thank the Republican Committee Members on Finance and Ways & Means for the countless hours and hard work they put into this process. I’d also like to thank the entire Republican Caucus for standing united and saying NO to the outrageous increases in taxes and spending. I regret to say that House Democrats passed their irresponsible budget on Thursday. From the beginning, it was clear House Democrats were dead-set on undoing the success of the previous two Republican budgets. Where do I start? Their budget creates over $400 million in new or increased taxes and fees. This includes a 0.5% income tax to fund their flawed family leave plan.. Even with this new tax, the plan is likely to be insolvent. Additionally, this plan is mandated, contrary to the Governor’s far superior voluntary proposal. They also funded their biggest initiative using a brand new capital gains tax. If passing a new tax wasn’t bad enough, House Democrats inflated their revenue estimates by over 50% in just one month. This will undoubtedly leave New Hampshire taxpayers in a terrible situation in the future if revenue shortfalls need to be covered. This budget irresponsibly increases Total Fund spending by over 13%, $1.5 billion across all funding sources. Even the areas funded by our state taxes see an increase of 13%. Believe it or not, their irresponsible spending didn’t stop there. The Governor wisely chose to spend one-time funds on one-time projects. What did House Democrats do? They deleted the Governor’s proposed projects, and instead chose to spend that money on expanding government. Once again, taxpayers will be on the hook to make up the difference. 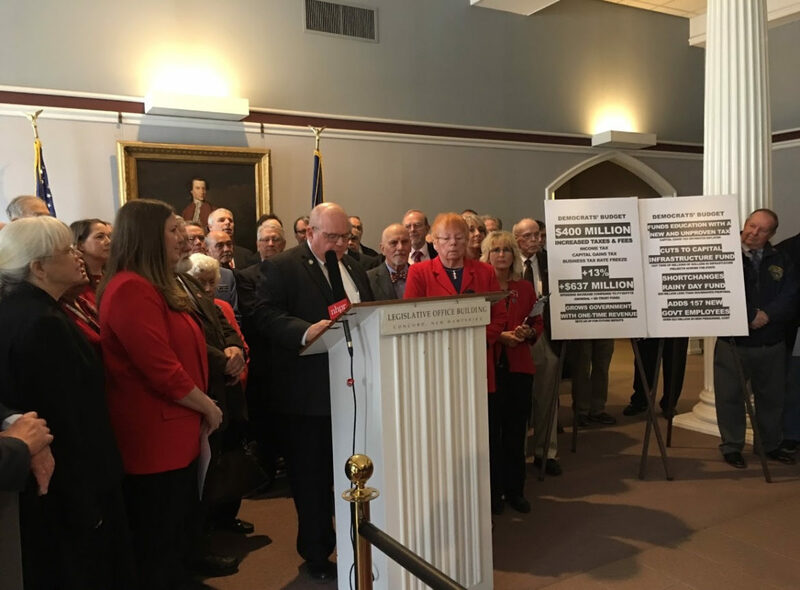 Click the link HERE to see video from our press conference regarding the House Democrats’ budget. 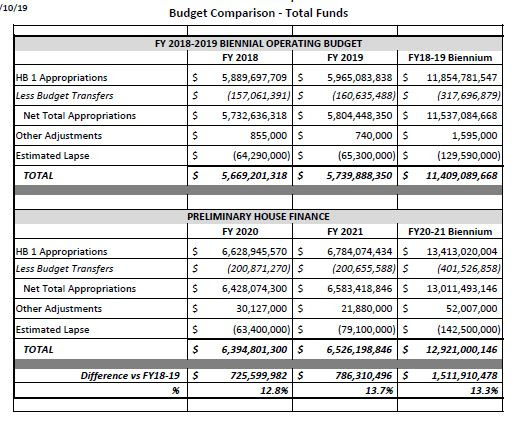 Below you will find two picture prepared by the non-partisan Legislative Budget Assistant comparing the House Democrats’ budget to our current budget for FY2018-2019. In the first picture you will see that they spent an additional $1.5 billion, a 13.3% increase in Total Funds. 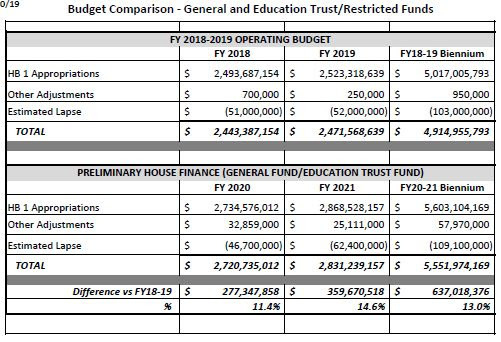 The second page shows the House Democrats’ proposed General and Education/Trust/Restricted Funds budget compared to the current one. This shows an increase of $637,018,376, a 13.0% increase. Click the link HERE to see Representative Sherm Packard on CloseUp discussing issues related to the budget.